Coy Luther "Luke" Perry III (October 11, 1966 – March 4, 2019) was an American movie and television performer. 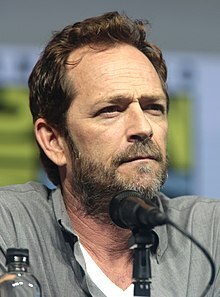 He was known for being in the show Beverly Hills, 90210 as Dylan McKay. He acted in many movies. Perry starred as Fred Andrews in Riverdale. He was born in Mansfield, Ohio. On February 27, 2019, Perry was hospitalized after suffering a stroke at his home in Sherman Oaks, California. He died at a hospital in Burbank on March 4, 2019, aged 52. ↑ Jami Ganz; Nancy Dillon (February 28, 2019). "Luke Perry, star of "Beverly Hills, 90210" and "Riverdale", hospitalized after suffering stroke". New York, NY: New York Daily News. Retrieved 28 February 2019. This page was last changed on 17 March 2019, at 13:57.